Building a great sounding car audio system is fun and very rewarding. I absolutely love driving good quality speakers with a great amplifier for powerful, amazingly clear sound. And I’m sure you will, too! Find the best car amplifier can be a very time-consuming task – there are so many choices out there. In order to help you, I’ve put together a list of 5 of the best car amplifiers worth your money today. You’ll also find some helpful buying info and basic car amp facts below too. Short on time? You can click here to jump to the product reviews & recommendations. Audio amplifier technology has moved forward over the last decade and the average buyer is a winner because of it. No longer will you have to choose between the same of average types, but fortunately a newer design type has made getting far more for your money in a smaller package possible. Car amplifiers, just like home stereo amplifiers, are all designed with a similar fundamental “class” which just means how they fundamentally operate to generate boosted audio signals that drive speakers. All powerful amps have to take the 12V supply in a vehicle and step it up to higher voltages in order to deliver more power with greater clarity than a standard car stereo can (as those are limited to around 14W per channel). Class A amplifiers are more rare and are consider “audiophile” amps as they are extremely low distortion and high-detail audio designs. However, they’re not as common because they’re very inefficient (somewhere around 20%!) and waste a huge amount of energy. Therefore they’re not used very often, and aren’t very popular. Class A/B amplifiers like this one were, until relatively recently, the only way to get big power with great sound quality in your vehicle with a good Watts per dollar ratio. 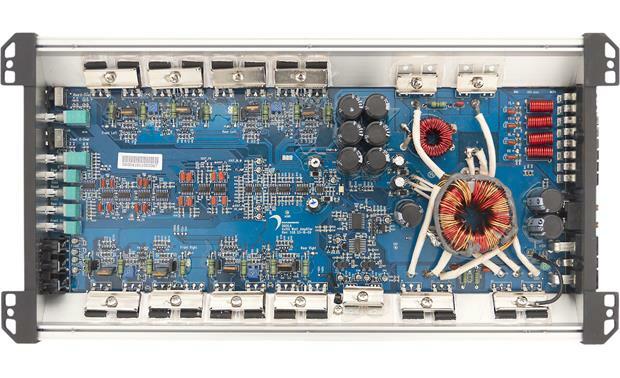 Class D amplifiers are now eclipsing them in value and power per size. Class A/B amplifiers are a compromise between class B amplifiers (in which the transistors that drive the output signal) aren’t switched on quite as long as in class A amps. However, to retain good sound quality they work in some similar ways as class A – just without wasting quite as much technology. They’re close to about 50-65% efficient and do generate some heat even while doing nothing. For decades they’ve been the most popular type of car audio amplifier in use. These basic design is used in the most low-cost amplifiers to very high-end car amps, although better brands have much better design components and circuitry to keeps the sound quality very high and noise and distortion very low. A/B amps come in a variety of low to high-power options, and are often bridgeable to deliver more power. Class D amplifiers are the newest technology and offer a new approach to audio amplification, with incredible efficiency and fantastic new installation options. As they’re around 90% efficient they produce an extremely small amount of heat and can be fit into very small chassis. This basic design works by switching driving transistors in the circuitry on and off incredibly fast rather than them remaining on long – thereby reducing the amount of electrical current used. The output signal is then smoothed and filtered to deliver a boosted audio signal to drive your speakers. Many powerful class D amps can fit under seats, in storage containers, and in many other vehicle interior locations that were impossible for other amps in the past. If you’re wanting the best bang for your buck, you’re hard pressed to beat them! However, it’s critical to shop for the best quality as lesser brands have poor noise levels and mediocre sound quality. Class D amplifiers are the newest and most efficient car amp technology today. 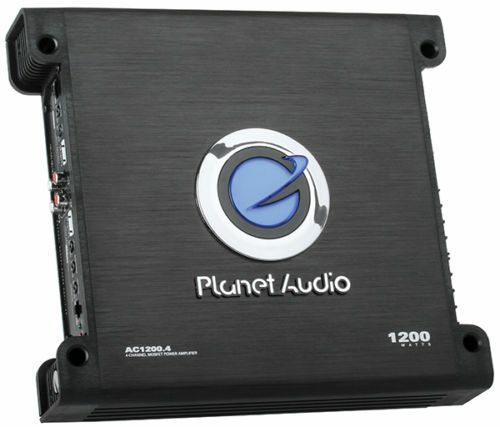 A great sounding and powerful amplifier that can drive a whole car audio system is small enough to fit in convenient places like under your car seat. Very cool! Although they’re very small and highly efficient, they main drawback is that they have a higher noise floor (lower signal-to-noise ratio) than A/B amplifiers. The technology has been refined more and more until today and is now capable of producing excellent sound with very low distortion. However, I’d advise staying away from lesser brands because they’re still noisier and the sound quality isn’t up to par with well-engineered products by companies like Alpine. 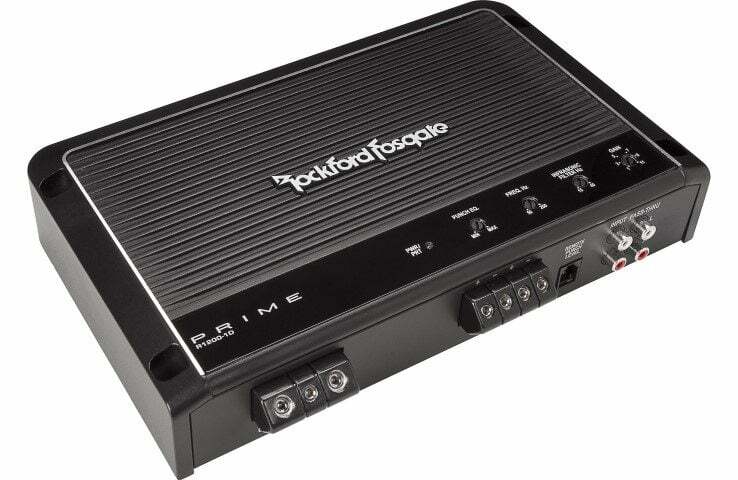 The best car amplifier for you will have well-designed quality and great engineering. I bring this up because although you can get an excellent amplifier for your money (see below) some brands aren’t original designs, and they simply rebadge – that is, slightly change and rename – the same amplifier internal board and parts. You’ll end up getting an “ok” amp in most cases but definitely not the best. To avoid getting a lesser amp for your money, stick to big name brands like Alpine, Pioneer, MTX, Rockford Fosgate, and a few other major players in the market. Definitely see my recommendations here today as I’ll ensure you get a great one. You’ll see some amplifiers – in some cases even very cheap ones – sold with claims like “1200 Watts power.” Which is completely misleading and is not what an amp in a small size is physically capable of producing. Unfortunately it’s one of the ways people new to car audio get ripped off and greatly disappointed. I always hate seeing that happen. Don’t get mislead when shopping! Some cheaper brands use misleading numbers that are IMPOSSIBLE for a cheap amp to deliver. Always check the root-mean-square (RMS) ratings as those are an electrical engineering term to describe the actual power being delivered. And remember to rely on the power rating into 4 ohms, as that’s the most common speaker impedance you’ll use. The best brands are “CEA-2006 compliant” which means the specs listed are proven and you can be assured they’re reliable and realistic. When shopping for an amplifier, rely on the Consumer Electronics Association (CEA) power standard ratings to know you’re getting accurate specs and not being mislead. The largest and more reputable manufacturers list their specs as required by this new industry standard created in recent years because of the ongoing issue with inaccurate and exaggerated amplifier power numbers. 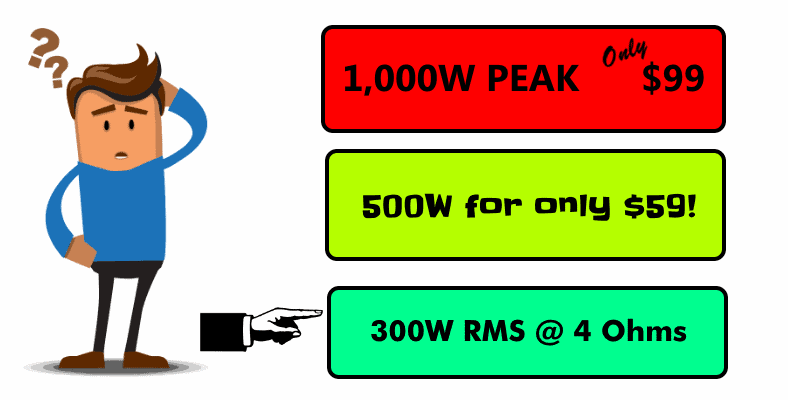 For a good quality amp that the average person can afford you can expect power ratings like 50W, 75W, or 100W RMS per channel into 4 ohms, for example. 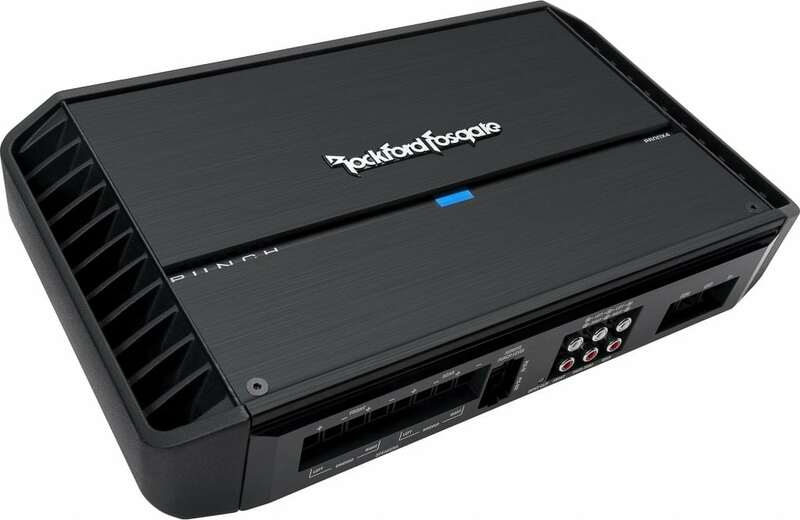 The best car amplifier for most people will cost about a little under $200 for average power ratings or closer to $300 if you wanted a more powerful (like 100W/channel). Expect to spend more for even higher sound quality and extra features. 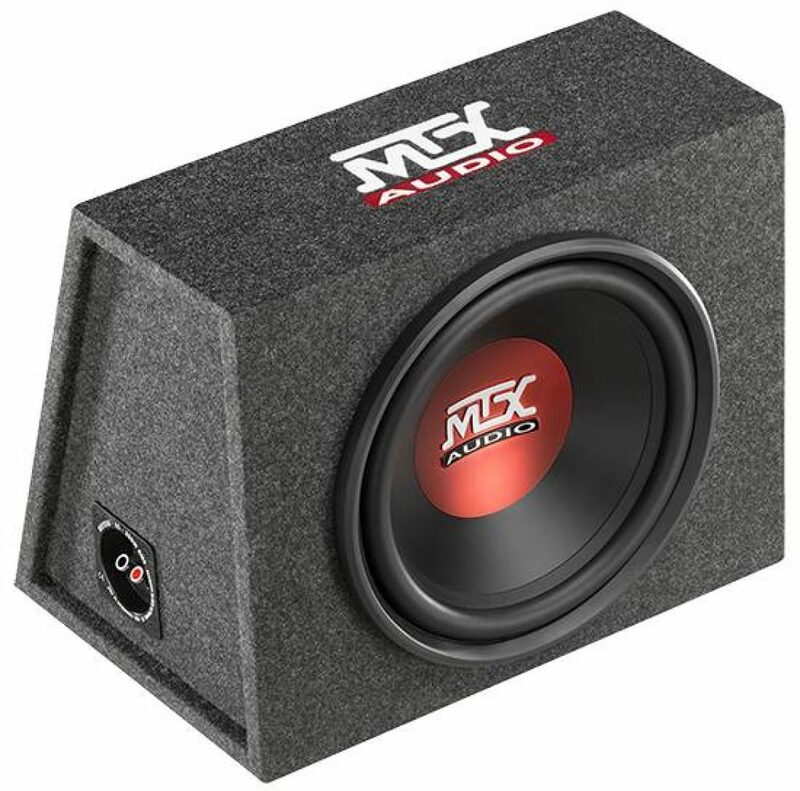 For most people wanting to upgrade a factory system or drive new speakers, 50W RMS/channel minimum is good and will provide great volume and low distortion. This includes being able to drive your speakers with good bass, although you’ll probably want to block very low distortion-causing bass by using a built-in high pass crossover feature to achieve even better sound. For larger cone size subwoofers, plan to have at least 150W or so as a good rule of thumb for enough power to drive it well for good bass sound and some good “jamming” from time to time. If you wan’t bass volume that vibrates your neighbor’s windows and rattles your car, get 2 x to 3 x as much. If you plan on using subwoofers, expect to have about 150W minimum available, either from a single channel or from a stereo pair of channels bridged together. For larger subwoofers like 10″ and 12″ which can really thump, I’d recommend 300W as a good rule of thumb. You may be surprised who great and loud a well-tuned system with a 50W per channel high-quality amplifier can sound! I personally prefer a 75W per channel I model that I can bridged for 300W. 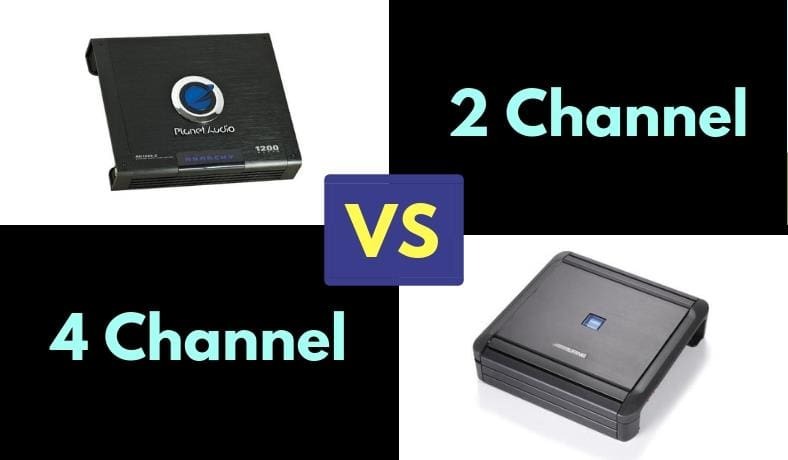 If you only need 2 channels of power you’ll find plenty to choose from. However, try to think about future expansion! Try to plan ahead just in case you want to expand or upgrade your sound system later. A 4 channel amplifier may be a better choice as it can always be used as a 2-channel amp but the reverse is not true. Here’s a diagram showing these basic and popular systems. 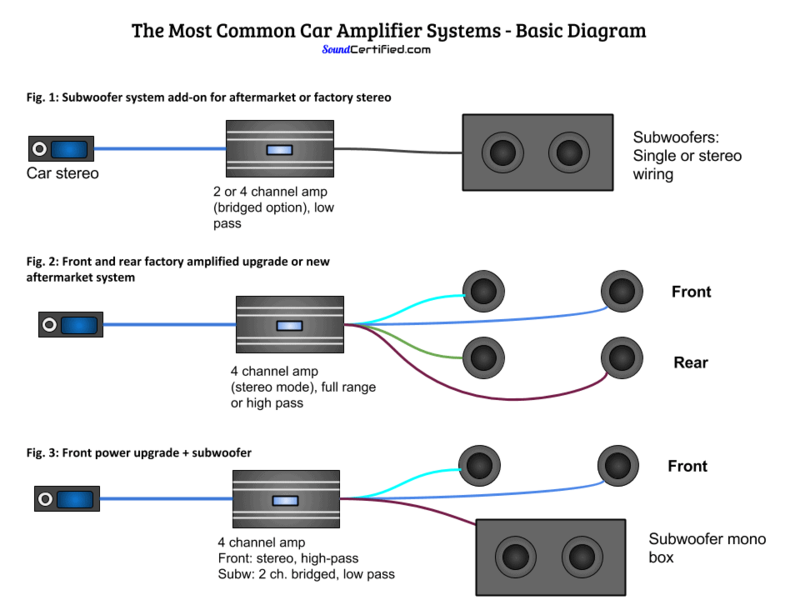 I personally prefer 4 channel amplifiers unless I need higher power for a 2-channel speaker setup, or for customers who aren’t needing rear or additional speaker flexibility. 2 channel amplifiers do tend to have higher power rating options available, but that’s not always the case. 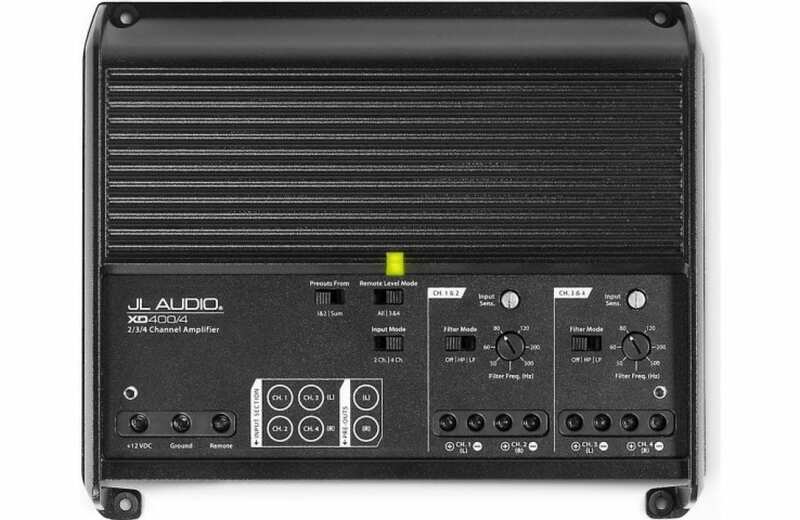 Additionally, since most 4 channel amps sold today can be bridged for more power it’s almost not an issue at all. If you’re using a factory stereo you can still get great sound but will want to look for an amplifier with speaker-level inputs to avoid having to buy an additional adapter. You can tap off of existing speakers in the trunk or from the rear of the stereo as needed to get a signal source. Small gauge speaker wire works fine for this. More difficult systems like factory premium (factory amplified) systems may require more labor and hunting down additional wiring info. Generally speaking, however, it still can be done as long as you’re able to find a pair of full-range speaker or speaker wiring you have access to and can run wire to the amp from. High-end sound and performance in a small package. Fantastic! NexD high-fidelity class D design. Only 8-9/16 x 2-1/16 x 7-1/8" In size! Up to an amazing 1200W RMS of slammin' bass power! 1. 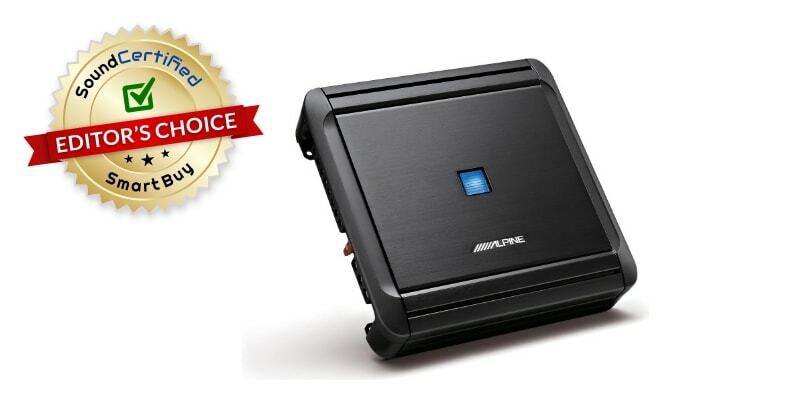 Alpine MRV-F300 – Affordable, great sound, wonderful quality, and ease of installation in a compact size. 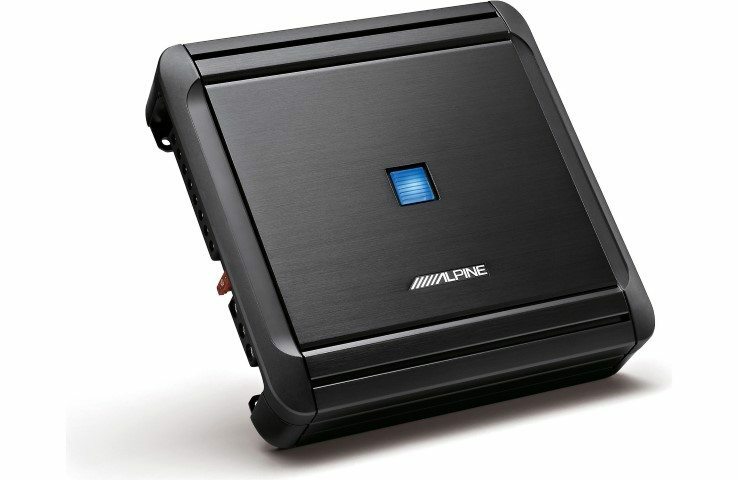 The MRV-F300 is Alpine’s most recent take on a class D amp that has been welcomed to rave reviews and it a fantastic way to drive your whole system from an amp small enough to fit below a seat! Unlike competitors the company takes additional steps to reduce noise inherent in class D designs and provides 50W x 4 into 4 ohms and bridgeable power of 150W x 2 into 4 ohms. Of course, it has crossovers (adjustable) for both subwoofer or full-range speaker use as well as a nice bass boost on channels 3/4. The whole amp measures only 7 7/8″ W x 6.5″ D x 2 3/16″ H (200 x 165 x 55 mm) and provides speaker-level inputs for working with factory systems. I’ve also provided a full review here. It features the usual over-temp and short-circuit protection Alpine has always provided and is an excellent buy (at below $200) and is a fantastic sounding little amp. You can head over to Amazon to see the many great reviews and why so many owners love it. 2. JL Audio RB XD400/4 – 75W x 4 underated power channels of some of the best audio you can buy…and fits under a seat! Still an industry leader, JL Audio has approached compact audio amplifier design by improving class D technology. They’ve introduced NexD circuitry which uses a much faster switching speed than the lesser competition to improve power delivery as well as noise levels. The amp is rated at – and will actually outperform – the listed specs of 75W x 4 into 4 ohms. It’s a fantastic and vibrant sound amplifier that’s still very small at only 8.52 in. x 7.09 in. x 2.05 in. (217 mm x 180 mm x 52 mm) but can accept 4 gauge wire. Low and high pass crossovers are adjustable to 500hz for additional sound system control and a 2/4 channel input switch can use a 2-channel signal to run all 4. An additional feature is a pair of RCA outputs with selectable output signal (mono summed or stereo). Wire terminals area very high quality (audiophile grade) and it’s one of the best rated amplifiers among buyers, too! Another cool feature is the ability to plug in a remote bass knob (sold separately) to control the bass while drive when using subwoofers. If you’re looking for one of the best amplifiers available today, this is it. It’s available at major online retailers but I've seen it for much less over at Amazon. 3. 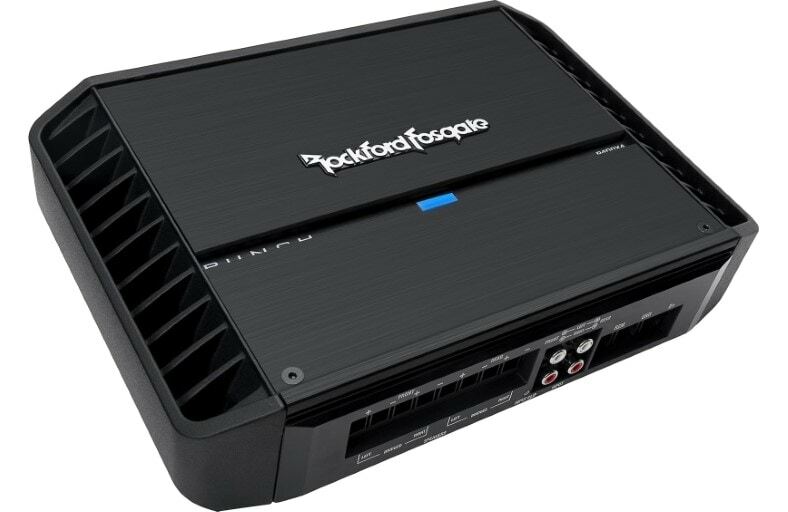 Rockford Fosgate Punch R1200-1D – A small subwoofer amp an AMAZING power output of up to 1200W! It even includes a remote bass control in the package to allow you to adjust the bass level while cruising down the road. 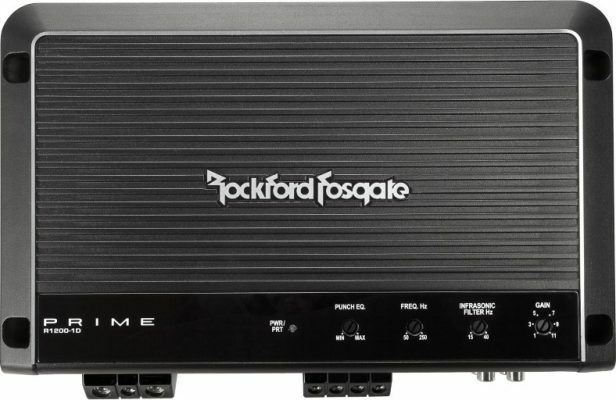 As Rockford Fosgate is one of the best amp companies designing products in America today, it also includes a verification sheet just for your specific amp showing the performance meets rated specs and the amp leaves the factory with everything checked out. It’s a mono (subwoofer) amplifier so for subwoofer-only system expansion it’s a fantastic choice if you want real power that SLAMS, high SPL music, and the ability to safely run multiple subwoofers without overheating and shutdown. A built-in low-pass crossover is adjustable from 50-250hz and a Punch EQ bass boost is another feature to help with getting the best sound from your system. 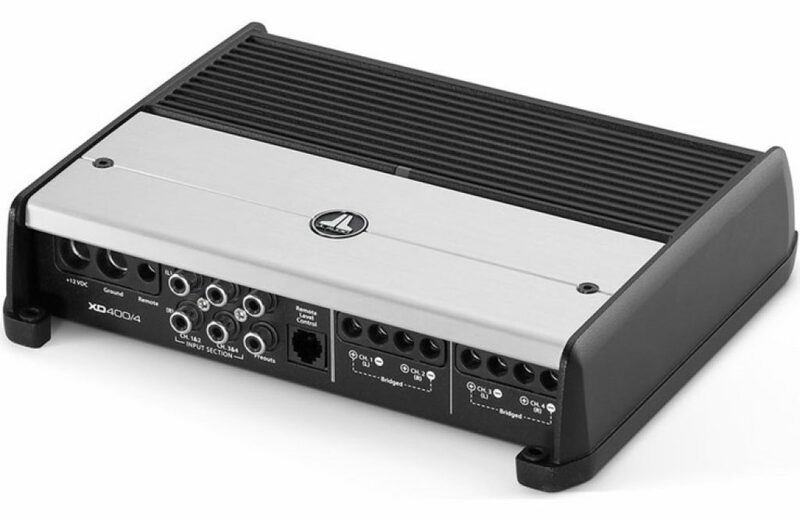 The amp can’t support speaker-level inputs but does feature RCA pass-through jacks for connecting additional amplifiers. The Punch R1200-1D includes an awesome bass remote with connection cable that’s really to install. I really like and I’m sure you will, too! It makes cranking the bass up very convenient when driving. This little amp is an amazing amount of clean, reliable sound in a compact package and normally sells below $300. Reviews are excellent and it’s a great choice if you want high-end power you can afford! Definitely head over to Amazon to check out the current price. 4. Rockford Fosgate Punch P600X4 (and P400X4) – low-noise class AB sound quality, great power, and setup features no one else offers. If your budget allows you to spend a little under $300 or so (based on the best price I’ve found when comparing), the P600X4 is one of the best on the market today. 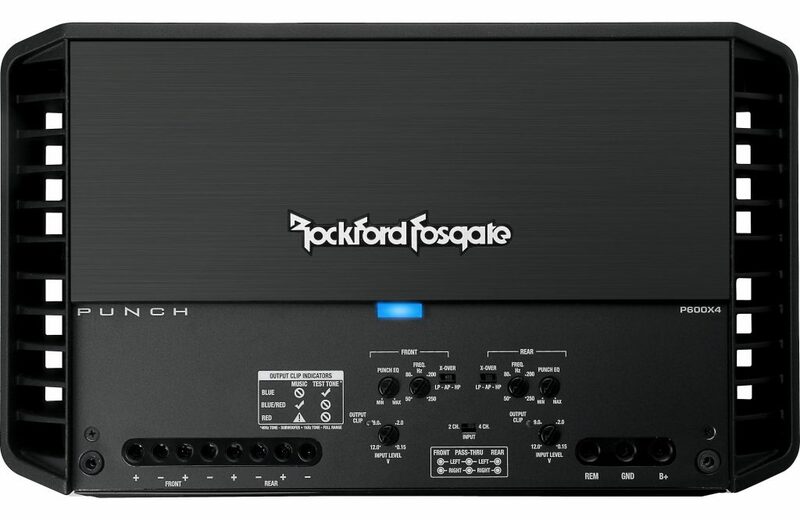 Rockford Fosgate has once again designed another fantastic sound-quality oriented class A/B design featuring their patented Trans-ANA circuitry to deliver lower noise and some of the best sound quality available in this price range. They’ve used surface mount technology (SMT) to make the amplifier as compact as possible, measuring only 13-3/8″W x 2-7/16″H x 8-13/16″D in size. Plenty enough to power a fantastic sounding, high-volume custom system for nearly everyone! The high and low pass crossovers are adjustable to 250Hz, while the Punch EQ2 is unique from other brands in that it’s adjustable for both bass and treble with 0-18 dB level possible at 45Hz and 12.5KHz. You can also add a Punch EQ remote control knob (sold separately) to adjust the sound while driving. It doesn’t support speaker level inputs, but a 2/4 way input switch is provided for the RCA inputs. One of the most unique features is the installation help provided by the instructions and the built-in C.L.E.A.N. gain setup system feature. When used with the included test tone CD, actually allows the amp to show the correct signal levels when setting the gain! This will allow you to get the lowest-noise and best optimization for your amp. You can also download test MP3 files as well. Its sibling the P400X4 has the same features with 50W x 4 power and is less expensive. It’s an awesome amp and definitely I recommend it to anyone who can afford it. It’s worth your time to head over and read more - the reviews are great! Let’s face it, some of simply don’t have a lot of money to spend on a car amp. That’s ok, it’s understandable. Believe me, I’ve been there too! If you still want good sound with adequate power and a way to at least get started with an entry-level system, the AC1200.4 is a great choice. For around $100 (or less) you can get an amp a good track record of happy buyers, built-in crossovers, and enough power to run your system and enjoy music on the cheap! It can also connect to factory speaker-level wiring. 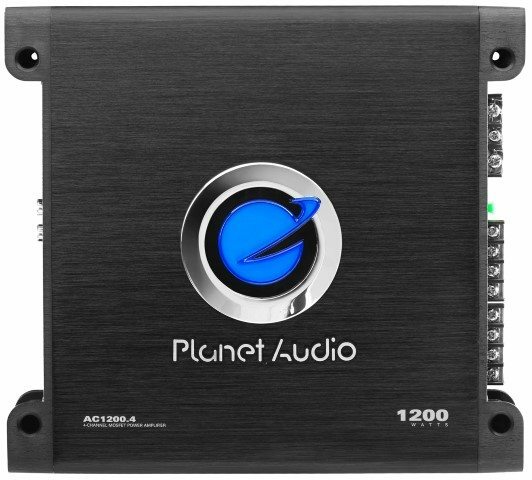 The Planet Audio is also sold as Boss and other brands with minor cosmetic differences, and overall have pretty good reviews as well. I definitely recommend you step up to the Alpine MRV-F300 but if you can’t afford to do so, it’s a good way to get started enjoying great music. Check out the great buyer reviews and current low price over here now. Following my guide, try to buy the best amplifier you can according to the level of power you need and based on your goal: maximum sound quality, loud bass, or just an affordable but great sounding system. Don’t forget the wire! Check out this great amp wiring kit buyer’s guide with some fantastic choices you can afford. Be sure to let me know in the comments below or via my contact page if I can help. 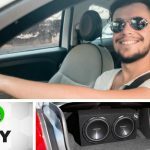 The Best Budget Mono Car Amplifiers Under $100 – 3 Affordable Gems! 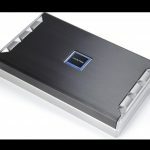 The Best Car Amps Under 200 & 225 Dollars – Five Fantastic Buys!